This chair was made in proper proportions for a child. Lucky kid! 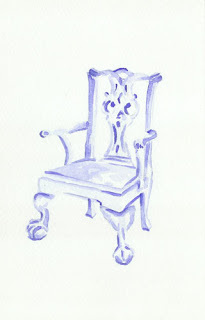 A cupid's bow crest, scrolled handholds, and ball and claw feet make this a charming chair. I can't imagine that the two circles on the chair back, just below the aforementioned cupid's bow crest, weren't intended to look like an owl's face and eyebrows. My first (and close to last) piece of sculpture I ever made was of an owl, formed eagerly from damp clay at the art classes I took one summer from the Sister's of Notre Dame. My owl had a big crooked nose, and his body was much too wide and boxy, but still, I loved that little owl. Funny how things like that get lost over the years. Who knows where it is now.